Facets on both the front and back of this sophisticated diamond design reflect the color at the top of the base up through the clear acrylic, creating highlights in this jewel of an award. The black acrylic base provides a sturdy and elegant foundation for the large personalization area. Polished acrylic offers value in a majestic award design. Jade acrylic rectangular award attached to a jade acrylic beveled base. 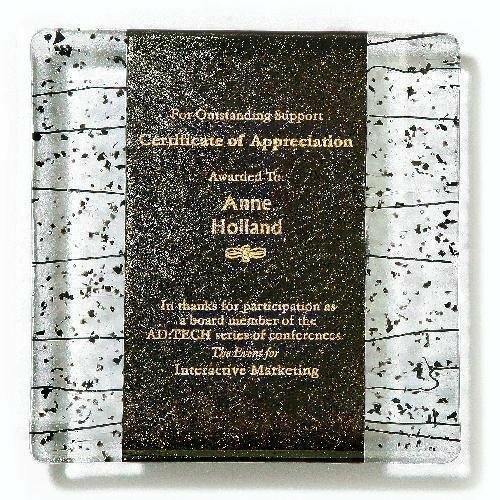 8" x 5-1/2" x 2"
9" x 6-1/2" x 2"
Multiple facets reflect the color at the top of the base up through the clear acrylic, creating highlights in this distinctively beautiful award. The black acrylic base provides a sturdy and elegant foundation for the large personalization area. Polished acrylic offers value in an exquisite award design. This Gold Fan Halo Acrylic Award is a great award for employee appreciation, achievement or any type of award presentation. Engraving to a frosted white color, this acrylic award is available in multiple sizes. The facets along the edges of this graceful flame design reflect the color from the top of the base up through the clear acrylic, creating highlights in this stylish award design. The black acrylic base provides a sturdy and elegant foundation for the large personalization area. 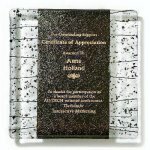 Polished acrylic offers value in an artful award design. The jagged frosted top on this unique rectangle design reflects the color at the top of the base, creating a subtle hue that unifies the award. The black acrylic base provides a sturdy and elegant foundation for the large personalization area. Polished acrylic offers value in a creative award design. A a beautiful black crystal base topped with a gold acrylic strip supports a 5/8" thick acrylic faceted diamond to give this award tons of dimension and visual interest. The facets cut on both the front and back of the diamond catch the light, drawing the color up to reflect throughout the piece. Available in 3 sizes to fit your award needs, this stunning modern award design is sure to impress your recognized achievers. Drama is fused with art glass in this amazing collection of art for the wall. A gold center is accented with clear and black glass with a wall hanger. Easy to laser engrave. A a beautiful black crystal base topped with a gold acrylic strip supports a 5/8" thick beveled acrylic rectangle, giving this award tons of dimension and visual interest. The bevels at the top and on both sides of the rectangle catch the light, drawing the color up to reflect throughout the piece. Available in 2 sizes to fit your award needs, this stunning modern award design is sure to impress your recognized achievers. A a beautiful black crystal base supports a 5/8" thick rectangle acrylic that features a carved frosted wave design across the middle. The wave offers dimension and a sense of motion, while light reflects off the gold at the top of the base, drawing the color up lending a hint of color throughout the piece. Available in 2 sizes to fit your award needs, this stunning modern award design boasts dimension and visual interest that is sure to impress your recognized achievers.